We’re pleased to announce the launch of new websites for CV Distributors and UAN, part of the AAUK group of companies. These sites can be found at https://cvdistributors.co.uk/ and http://unitedaftermarket.net respectively. Designed on the same platform as the new AAEU and GROUPAUTO websites released late last year, these sites complement the new AAG family of sites, and present a cohesive image of the group. Strong brand presence and a focus on imagery, paired with a simple layout make it easy for visitors to navigate the site and keep up to date with the latest news and investments. 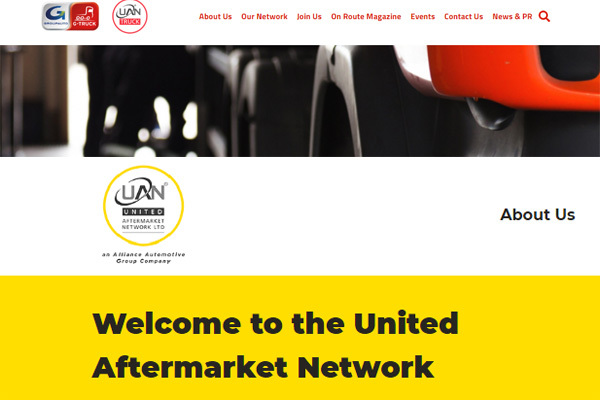 The UAN site features information on the network, how to register interest and join the UAN, forthcoming events, and an Affiliate Directory to help customers find their local UAN member. The CV site contains information on the G-Truck and UAN Truck networks, the CV-Logix warehouse and the TruckTec brand of CV parts and fluids. There is also easy access to Top Truck, the groups garage workshop programme, a valuable resource for purchasing benefits, marketing, training and technical support. Visitors to the site can view the latest edition of On Route magazine, alongside news from around the network and wider AAUK group of companies, and are directed to useful information on becoming a member or supplier of the G-Truck and UAN Truck networks. A comprehensive member directory helps customers to find their local network member. Both sites feature a handy events calendar to keep members in touch throughout the year, and queries received via the Contact Us form will be directed to the appropriate team in the business unit.